This employment information comes from the U S Department of Labor Bureau of Labor Statistics. Nonfarm payroll employment rose by 213,000 in June, and the unemployment rate increased to 4.0 percent. Job gains occurred in professional and business services, manufacturing, and healthcare, while retail trade lost jobs. Incorporating revisions for April and May, which increased nonfarm payroll employment by 37,000, monthly job gains have averaged 211,000 over the past 3 months. This information is detailed in Charts 1 and 2 below. Employment in professional and business services rose by50,000 in June. Over the year, employment in the industry is up by 521,000, with gains in employment services, computer systems design, services to buildings and dwellings, and architectural and engineering services. Manufacturing employment increased by 36,000 in June. Job gains occurred in durable goods components, including fabricated metal products (+7,000), computer and electronic products (+5,000), and primary metals (+3,000). Motor vehicles and parts also added jobs over the month (+12,000), after declining by 8,000 in May. Over the year, manufacturing has added 285,000 jobs, with about three-fourths of the gain in durable goods industries. Health care employment increased by 25,000 over the month and is up by 309,000 over the year. Hospitals added 11,000 jobs in June, and employment in ambulatory care services continued to trend up (+14,000). Construction employment continued to trend up in June (+13,000). The industry has added 282,000 jobs over the year. Employment in mining also continued on an upward trend in June (+5,000). Mining employment has expanded by 95,000 since a recent low point in October 2016, almost entirely in support activities for mining. Retail trade employment declined by 22,000 in June, mostly offsetting a gain (+25,000) in the prior month. Employment in the industry has been about unchanged since February. 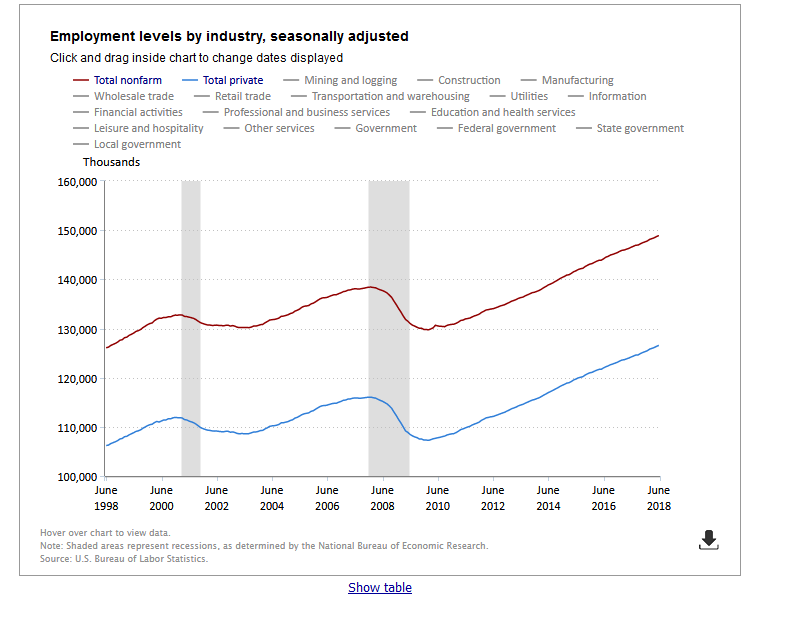 Employment in other major industries–wholesale trade, transportation and warehousing, information, financial activities, leisure and hospitality, and government–showed little or no change over the month. Average hourly earnings of all employees on private nonfarm payrolls rose by 5 cents in June to $26.98. Over the past 12 months, average hourly earnings have increased by 2.7 percent. From May 2017 to May 2018, the Consumer Price Index for All Urban Consumers (CPI-U) increased by 2.7 percent (on a seasonally adjusted basis). 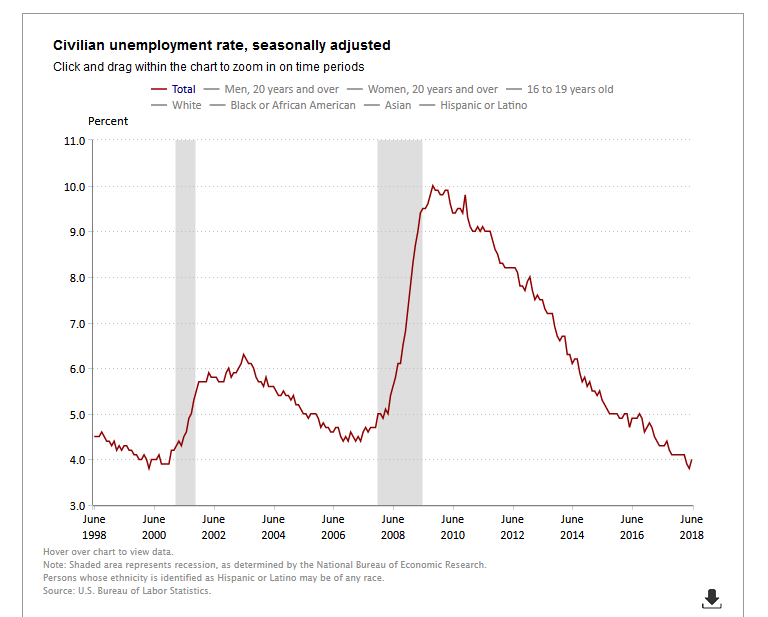 Turning to data from the survey of households, the unemployment rate rose from 3.8 percent to 4.0 percent in June. The number of unemployed people increased by 499,000 to 6.6 million. Real average hourly earnings for all employees increased 0.1 percent from May to June, seasonally adjusted, the U.S. Bureau of Labor Statistics reported today. This result stems from a 0.2-percent increase in average hourly earnings combined with a 0.1-percent increase in the Consumer Price Index for All Urban Consumers (CPI-U). 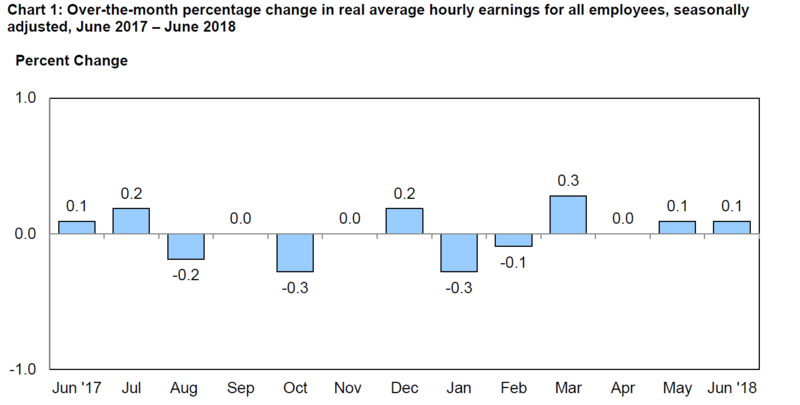 Real average weekly earnings increased 0.1 percent over the month due to the change in real average hourly earnings combined with no change to the average workweek. This information is detailed in Chart 3 below.